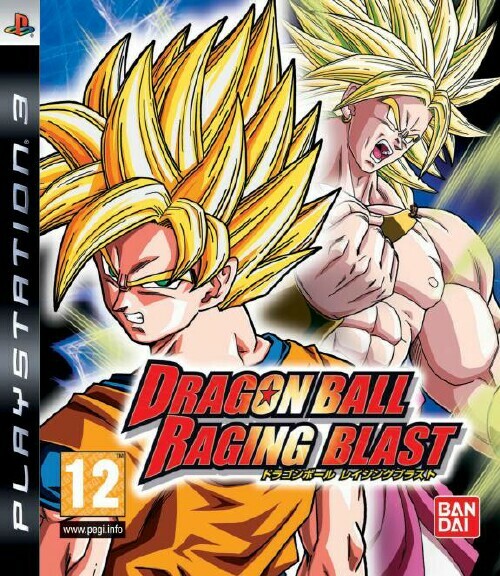 Ace here, reviewing the next installment of the Dragon Ball games for the Playstation 3 consoles - Dragon Ball Raging Blast. This game features every character within the Dragon Ball Z series from my favorite character, who happens to be Majin Vegeta to Brolly to everyone's favorite superhero in the series Goku. Everyone shows up to be in this awesome game, which to be honest, in my opinion is the best game in the series. I will give you an overview why this is a purchase for every Dragon Ball Z game. The minute I picked up this game I was a bit skeptical because I played Dragon Ball Budokai Tenkaichi 3. In my humble opinion, it was good, but it got old quick and I ended up taking it back before the due date. Now Raging Blast has so many options to get you addicted. 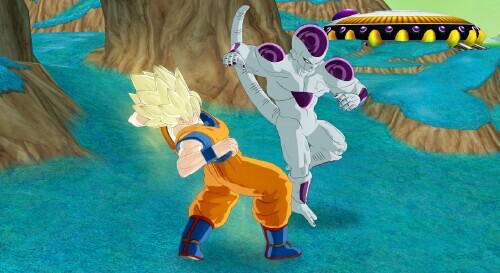 The game modes Bandai/Namco gives us is Dragon Battle Collection, Super Battle Trial, Versus, World Tournament, Online Battle, Ultimate Customize, Museum and Dojo. Let's start with the Dojo, which is a tutorial of going through the numerous offense and defense attacks. It's pretty easy to get through all the lessons and you can actually skip some of them to achievements. Dragon Battle Collection is pretty addictive because it goes over all the sagas (Saiyan, Android, Frieza, and Majin Buu) plus it adds the Brolly and Bardock stories. What's also pretty cool is the game has "What If?" 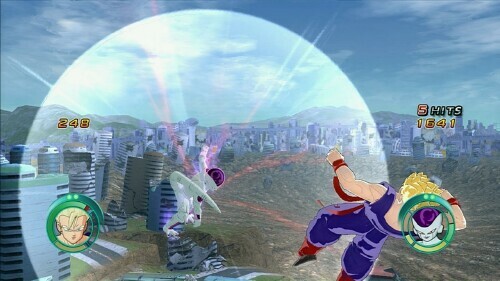 stories; for example Kid Trunks going against the Teen Trunks or if Bardock goes against his grandchildren (this mode I ended up playing the most). 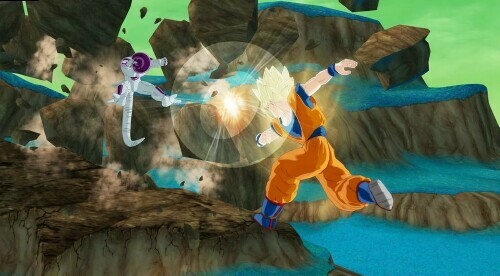 What I wish they could have implemented would be a more interactive way to tell the story of the characters because it feels like I was being pushed into battle. Ultimate Customize is where you edit any characters super moves into moves you earn or take items to add to the super moves for something pretty effective attacks during a battle. World Tournament is basically a mode where you can play in the world tournament or in the cell games so you can go through numerous brackets until you can crown a grand champion. Since this game is produced by Namco, there are similarities to the Tekken and Soul Calibur series. A good example of this would be Super Battle Trial and Museum. Super Battle Trial is also known as Survival mode where you would go against randomly picked opponents until you're knocked out. Museum reminds me of Soul Calibur because you can earn achievements to view an assortment of items and listen to the game's limited choice in music. Sound: In this department, there isn't much to talk about, simply because almost everything is on point. The sounds of blows between the fighters, backgrounds collapsing, to each of the character's voice, are crisp and clear. I have two gripes with the sound. Sometimes the dialogue between characters will be muted. This is a little problem especially when you turn off the subtitles. My second problem is the lack of options in the BGM especially during battles this can get annoying. Otherwise, everything else in this department is exceptional. Graphics: Raging Blast'scel-shaded graphics are amazing. Every character is correct to a tee. The only gripe I have with the graphics is the lack of environments available. Sure there are environments from the Frieza, Cell, and Buu Saga, but Namco Bandai could have been a little more creative on this front. Controls: Well, the control can be good and bad depending on your situation in the game. When you do the tutorials, this game has a snappy feel. Any button pressed the character being controlled will automatically react to the situation. On the other hand when it comes to actual battles, you will find yourself mindlessly mashing away until you get a response from your character which is not good at all! (TRUST ME!) Also, when trying to defend moves from time to time the controls won't always click and you can end up taking some serious damage. I ended up having to press R1 + O like a mad man to get the game to work a couple of times. Conclusion: Dragon Ball: Raging Blast is a pretty good game; its definitely not perfect though. At times the controls leave a lot to be desired and the background choices are limited (I wish they could have been more creative). 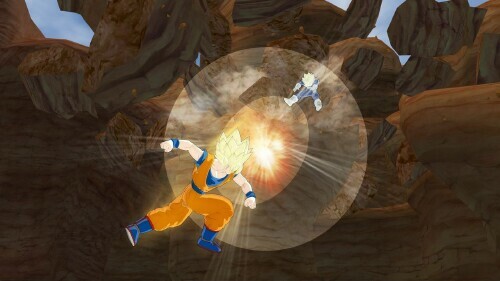 Namco Bandai could have implemented a story mode like say Dragon Ball Budokai Tenkaichi 2 and "The Dragon Ball Collection" despite being the best mode in the game feels rushed. 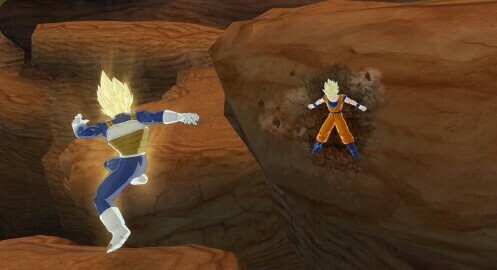 Overall, this game is for any Dragon Ball Z fan such as myself. Out of TOV 5 stars I give Dragon Ball Raging Blast 4 stars.